WASHINGTON — In carrying on a tradition that was reportedly started by then-President George W. Bush and continued by Barack Obama, President Trump hosted a ceremonial lighting at the White House on Tuesday in recognition of the Hindu Festival of Lights, known as Diwali. The holiday rings in the Hindu new year as adherents to the polytheistic religion commonly call upon the “gods” of wealth and wisdom to bring good fortune to the days ahead. Trump noted that America is home to many of Indian heritage, and recognized those at the gathering who serve in his administration, including Ajit Pai, the chairman of the Federal Communications Commission (FCC); Seema Verma, the administrator of the Centers for Medicare & Medicaid Services; Neil Chatterjee, chairman of the Federal Energy Regulatory Commission (FERC); and Raj Shah, who serves as the deputy White House press secretary. He also spotlighted Neomi Rao, who Trump announced as his selection to replace now-Supreme Court Justice Brett Kavanaugh on the D.C. Circuit Court of Appeals. 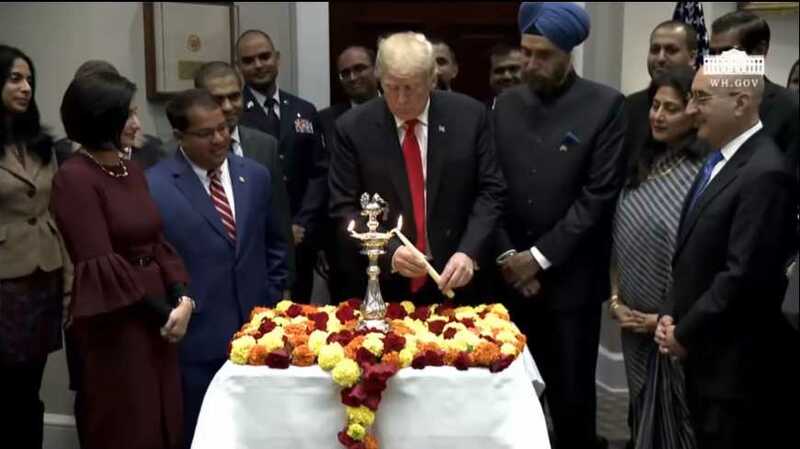 Trump then moved to a table with a diya in the center, lighting the lamp with a lit candle. As previously reported, Diwali is an ancient festival originating in India, and is considered the largest shopping season in the Hindu religion. In addition to hanging lights and sharing legends and mythological stories about battles between good and evil, Hindus offer prayers to one of more of their deities—most commonly Lakshmi, the “goddess of wealth” and spouse of the myth god Vishnu. “Some believe that Lakshmi wanders the Earth looking for homes where she will be welcomed. People open their doors and windows and light lamps to invite Lakshmi in,” National Geographic outlines. The festival lasts for five days, but the third day is the central day of the observance, which also recognizes Ganesh, “the elephant-headed god of wisdom.” Especially in India and Nepal, dogs and cows are celebrated as being sacred creatures, and are decorated with red dye and garlands of flowers. “According to Hindu tradition, the dog is a messenger, believed to guard the gates of the afterlife. So on that second festival day, all dogs get special recognition and honor,” explains the site DogTime. Buddhists, Sikhs, and Jains observe Diwali as well, but for various reasons. Trump posted about the White House observance on Twitter.